Nose: Dried fruits, orange, wood spices – burnished oak. Finish: Extremely long, apple, spices, very slightly dry. Cask Combination: Sherry seasoned, European oak single casks. As they draw on some of the oldest and rarest casks at The Macallan Estate, each year’s bottling will be different. The 2009 release is bottled at 48% and drawn exclusively from sherry seasoned Spanish oak casks which have been solely grown, cared for and crafted by the Tevasa cooperage. 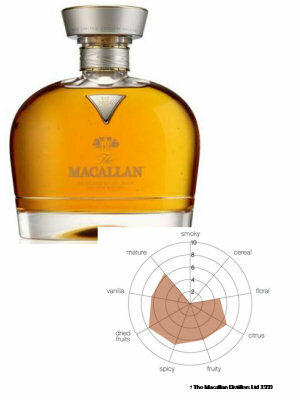 This is a truly unique expression from The Macallan. Paul Pacult - Brilliant deep color; impeccable clarity. Off-the-charts aromas. Entry is lush, luxuriously deep, sweet in a honeyed manner, and slightly baked; midpalate offers full-weighted tastes of dark honey, brown sugar, rum, oloroso sherry, and old oak. Concludes brown sugar sweet, fruity, and comforting in the mouth as the alcohol gently detonates in the throat, releasing waves of warmth. A perfect malt whisky and a benign force of nature.